Are you in the Southern California and looking for an honest and professional Pool Repair, Remodel, Upgrade or Weekly Pool Service with a company that has been around since 1978. We can take care of any of your pool needs. We can take care of any of your spa needs. Some pool and fountain companies are contracted with major equipment manufactures and can only use what they have, whether it fits your needs or not, you may not be getting the best for your job. Since H2O Technologies are not tied to any specific manufacturer, you get the best quality and the right equipment for your needs not the needs of a major manufacture. We pride ourselves in providing the best, highest quality and energy-efficient equipment H2O technologies offers only the best for your pool and spa needs. Call H2O Technologies for a new pool, remodel, spa, water features, fountains or even a small repair we do it all. With years of experience. Whether your dream area is simple and elegant or complex and extraordinary, H2O technologies knows how to keep your dream pool, spa, fountain or Koi pond looking its best. As a Licensed Contractor we can obtain all permits, remodel, and install new energy-efficient equipment as needed. We work hard to turn your pool, spa , water features or fountains dreams into reality. 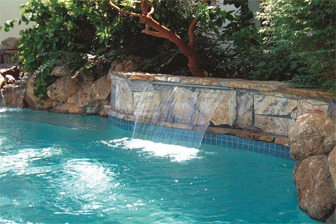 Our custom designs will help home and business owners enjoy beautiful spas, pool, fountains, ponds and water systems. We established a small swimming pool maintenance service in 1978 and expanded into commercial pools, fountains, ponds, streams, and lakes. With a swimming pool maintenance license, gained experience and expertise in repairing every aspect of water systems. Working for a major pool builder in Southern California as a designer/salesman, knowledge of construction was acquired. We upgraded to a pool construction license and have been building water features ever since. When you deal with H2O Technologies, you get a highly-skilled, trained and experienced contractor that knows and understands every aspect of this industry. We are looking forward to working with you to create your unique water feature, pool, spa Koi pond or landscaping. © 2012 H2O Technologies All Rights Reserved.